MS President Bill Clinton (William Jefferson Clinton) speaking at Democratic rally on campaign trail in 1992, HILLARY RODHAM CLINTON watching on. Can you believe that a man with this kind of record would be going around the country with a straight face, comparing himself to Harry Truman? President BILL CLINTON directs Sec. Of State WARREN CHRISTOPHER & dignitaries to the table where the documents lie in wait. VO notes that this is the same table from the 1979 signing of the Camp David Peace Accords. MSs of SHIMON PERES signing the Oslo agreement. C/A shot of YASSER ARAFAT looking on. Mr. Peres stands, crowd applauds. MSs of MAHMOUD ABBAS sign the Oslo agreement; applause at outset. MS diplomats shaking hands. MSs Russian foreign minister signing as witness. Mr. Christopher signs as witness to the agreement on behalf of the US. Arkansas Governor BILL CLINTON (William Jefferson Clinton) says he knows many people who have lost their jobs to overseas competition, and that "the trick is to expand our export base and to expand trade on terms that are fair to us... Make sure other countries are as open to our markets as our markets are to them... Change the tax code. There are more deductions in the tax code for shutting plants down & moving overseas than there are for modernizing plants here. Our competitors don t do that... Stop the federal government's program that now give low-interest loans & job-training funds to companies that will actually shut down & move to other countries but we won t do the same for plants that stay here. More trade but on fair terms, and favor investment in America." Unidentified white man wearing suit & sporting ponytail and bushy moustache asks if the candidate can focus on the issues, and not on the mud-slinging of traditional campaign politics. U.S. President GEORGE BUSH (George Herbert Walker Bush) says caring, strength and a backbone are part & parcel to the Presidency, and he's more than willing to talk nitty-gritty. Reform Party candidate H. ROSS PEROT says he knows "the American people want to talk about issues, not tabloid journalism." Ross Perot says he has no spin doctors or speechwriters working for him, makes the audience laugh. Arkansas Governor BILL CLINTON (William Jefferson Clinton) says contrary to the opinion of his stage-mates, he has no experience with Washington politics-- "I'm just as sick as you are by having to wake up & figure out how to defend myself everyday." H. Ross Perot says he has no foreign money or lobbyists, and no PAC money working for his campaign. U.S. President GEORGE BUSH (George Herbert Walker Bush) says he strongly supports Congressional term limits: "... Congress has gotten kind of institutionalized. For 38 years, one party has controlled the House of Representatives. And the result? A sorry little post office that can't do anything right, and a bank that has more overdrafts than all of Chase Bank & Citibank put together... a bureaucratic arrogance if people stay there too long..." Governor of Arkansas BILL CLINTON (William Jefferson Clinton) says he opposes Congressional term limits b/c smaller states already have a difficult time getting their issues heard, and an increased influence from already-powerful non-elected Congressional aides; Bill Clinton says he prefers cutting the Congressional staff, spending caps on campaign finance, limits on political action committees, and open debate forums. Reform Party candidate H. ROSS PEROT says he would serve one term & one term only: "I do not intend to spend one minute of one day thinking about re-election." Ross Perot also says he would work as U.S. President for free. "We have got to reform government. If you put term limits in & don t reform gov't, you won't get the benefits you're talking about." Arkansas Governor BILL CLINTON (William Jefferson Clinton) walks directly to the woman asking the question regarding how the recession/national debt affects the candidates personally; he softens his voice and breaks down the image barrier by addressing the matter on a personal level; Bill Clinton blames the American rich and the Washington insiders for the recession, then says we need to invest in American jobs & education, and control health care costs. Governor of Arkansas BILL CLINTON (Williams Jefferson Clinton) delivers closing remarks: "... these problems are not easy, and they re not going to be solved overnight... the people of my state have let me be their Governor for 12 years b/c I made commitments to more jobs & better schools. Our schools are now better. Our children get off to a better start... and we have one of the most aggressive adult education programs. My state ranks first in the country in job growth... It happened b/c I can work with people... You have to decide whether you want to change or not. We do not need four more years of economic theory that doesn't work. We've had 12 years of trickle-down economics. It's time to put the American people first to invest & grow this economy... But you cannot get there just by balancing the budget... I got into this race b/c I did not want my child to grow up to be part of the first generation of Americans to do worse than her parents... I want to make America as great as it can be, and I ask for your help in doing it." 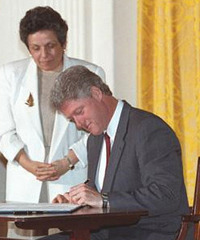 MS Former President Bill Clinton signing document as a small group watches behind him. 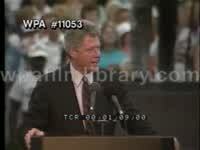 President Bill Clinton (William Jefferson Clinton) speaking at Democratic rally on campaign trail in 1992, The truth is the only part of Harry Truman s legacy that George Bush wants is a in the election. (DO NOT USE IMAGE OR AUDIO OF JIM LEHRER) Governor of Arkansas BILL CLINTON (William Jefferson Clinton) delivers closing remarks, thanks the Sun Valley computer & electronics executives, as well as business executives inclined for a change; the woman who adopted an AIDS baby; the woman whose husband lost his job. Gov Bill Clinton attacks the record of President George Bush. "I want the future of this country to be as bright & brilliant as its past, and it can be if we have the courage to change." Image and Narration of Jim Lehrer is not available for licensing. (DO NOT USE IMAGE OR AUDIO OF JIM LEHRER) Governor of Arkansas WILLIAM JEFFERSON CLINTON (Bill Clinton) says, "I represent real hope for change." Governor Clinton turns to President George H.W. Bush and says, "For 12 years you've had it your way, you've had your chance, and it didn't work. It's time to change. I want to bring that change to the American people." U.S. President GEORGE BUSH (George Herbert Walker Bush) says, "We've dramatically changed the world... the changes are mind-boggling. Kids go to bed at night w/o the fear of nuclear war. And change for change's sake isn't enough..." President George Bush says experience separates him from the pack. Governor Bill Clinton responds by promoting his state record statistics; "We have got to have the courage to change... I think the American people deserve better than what they're getting... We're living in a new world after the Cold War..."
(DO NOT USE IMAGE OR AUDIO OF JIM LEHRER) Governor of Arkansas BILL CLINTON (William Jefferson Clinton) says he honors the WWII military service of President George Bush but he takes offense to the President taking on his sense of patriotism, going so far as to invoke the ghost of Prescott Bush and his standing-up to Joe McCarthy; "I was opposed to the war but I loved my country. We need a President who will bring this country together, not divide it. We've had enough division. I want to lead a unified country." Applause. Ann Compton asks Governor Bill Clinton about tax cut guarantees for middle class families; Governor Clinton says his tax increase plan starts with the $200,000 + tax bracket; "In addition to that, with the money I raise from upper income people, and by asking foreign corporations to pay the same income tax as American corporations do will be used to give incentives back to upper income people." "I'd like to create more millionaires than were created under Mr. Bush & Mr. Reagan but I don't want to have 4 yrs of no growth in the private sector." (DO NOT USE IMAGE OR AUDIO OF JIM LEHRER) John Mashek asks H. Ross Perot about his proposed gasoline price increase; Reform Party candidate H. ROSS PEROT says the increase is incremental, and that he didn t create the problem, instead he's trying to fix it; "I know it's not popular. But the people who will be helped the most by it are the working people who will get the jobs created b/c of this tax... We've got to collect the taxes to do it. If there's a fairer way, then I'm all ears." Get it? Ross Perot has big ears! Joke intended, audience laughs. "I'm not playing Lawrence Welk music tonight!" Governor of Arkansas BILL CLINTON (William Jefferson Clinton) says there are two deficits in the U.S., one being a federal budget deficit, and the other an investment - jobs - income deficit: "People are working harder for less money than they were 10 yrs ago... we've got to invest and grow... it offers the best hope to put America back to work & get our incomes rising instead of falling." U.S. President GEORGE BUSH (George Herbert Walker Bush) says Ross Perot's gasoline tax is unfair & unnecessary, then says Bill Clinton's "tax and spend" plan is wrong; "... control the growth of mandatory spending & get taxes down... I've been talking about getting a capital gains tax cut forever..."
(DO NOT USE IMAGE OR AUDIO OF JIM LEHRER) Ann Compton queries H. Ross Perot on his economic plan & how he would use his Presidential powers to immediately get the American economy rolling again; Reform Party candidate H. ROSS PEROT says he would form economic teams to deal with existing federal plans, and send out task forces to deal with small and large business problems; "Convert from 19th to 20th century capitalism; You see, we have an adversarial relationship between government and business... put together your plans by Christmas, be ready to go when Congress goes..." Audience applauds. Governor of Arkansas BILL CLINTON (William Jefferson Clinton) says his first priority would be to pass a "jobs program," then to deal with health care costs and provide blanket health insurance for all Americans (universal health care); Gov. Clinton then touts his state record. U.S. President GEORGE BUSH (George Herbert Walker Bush) says he's already working on reviving the U.S. economy, and promises that James Baker will be put to work on domestic affairs. (DO NOT USE IMAGE OR AUDIO OF JIM LEHRER) Sander Vanocur queries U.S. President George Bush on the issue of drugs, but not before joking about his the incessant references to former U.S. President Harry S. Truman during the campaign, saying, "So much so that I think I'll wake up tomorrow & see him named as the next commissioner of baseball." 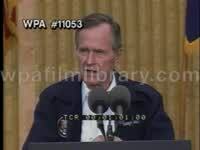 U.S. President GEORGE BUSH (George Herbert Walker Bush) says legalization of illicit drugs is not the answer, that we must continue to fight the war on drugs; President Bush says cocaine use among teenagers is down, but while saying this he curiously touches his nose and wipes it... ?! "We're using the military more now in terms of interdiction. Our funding for recovery is up..." "Legalization of narcotics... would be totally counter-productive." Reform Party candidate H. ROSS PEROT seconds President Bush's anti-legalization position, says crack babies cost the American taxpayer $125,000; "We went on the Libyan raid b/c we were worried that Quaddafi might be building up chemical weapons. We've got chemical warfare being conducted against our children... talk won't do it, folks." Governor of Arkansas BILL CLINTON (William Jefferson Clinton) says he's held crack babies in his arms, then says he has a brother who's a recovering drug addict; "If drugs were legal I don't think he would be alive today. I am adamantly opposed to legalizing drugs." Gov Clinton says more law enforcement, more on-demand treatment is needed. Footage of Interfaith Mass (church service) at the African Methodist Episcopal Church in Washington, DC: unidentified African-American minister delivering sermon about "entering a springtime of new beginnings" and "a bright tomorrow when the hyphen will drop out from Americanism"; President-elect BILL CLINTON, wife HILLARY RODHAM CLINTON, Vice President-elect AL GORE, wife TIPPER GORE, and CHELSEA CLINTON sit in pews, listening to the sermon; C/A JESSE JACKSON listening, nodding head; C/A Gen. COLIN POWELL (in uniform); gospel hymn is sung by unidentified white woman playing Korg keyboard. President BILL CLINTON (William Jefferson Clinton) continues Inaugural Address: We know we have to face hard truths and take strong steps. But we have not done so. Instead, we have drifted, and that drifting has eroded our resources, fractured our economy, and shaken our confidence. Though our challenges are fearsome, so are our strengths. And Americans have ever been a restless, questing, hopeful people. We must bring to our task today the vision and will of those who came before us. From our revolution, the Civil War, to the Great Depression to the civil rights movement, our people have always mustered the determination to construct from these crises the pillars of our history. Thomas Jefferson believed that to preserve the very foundations of our nation, we would need dramatic change from time to time. Well, my fellow citizens, this is our time. Let us embrace it. Nice C/A wide shot, zoom in, of the Jefferson Memorial; C/As audience. Our democracy must be not only the envy of the world but the engine of our own renewal. There is nothing wrong with America that cannot be cured by what is right with America. And so today, we pledge an end to the era of deadlock and drift a new season of American renewal has begun. To renew America, we must be bold. We must do what no generation has had to do before. We must invest more in our own people, in their jobs, in their future, and at the same time cut our massive debt. And we must do so in a world in which we must compete for every opportunity. It will not be easy; it will require sacrifice. But it can be done, and done fairly, not choosing sacrifice for its own sake, but for our own sake. We must provide for our nation the way a family provides for its children. C/A cute white baby in pink winter coat; C/A cute Latino or Mulatto boy. Our Founders saw themselves in the light of posterity. We can do no less. Anyone who has ever watched a child's eyes wander into sleep knows what posterity is. Posterity is the world to come the world for whom we hold our ideals, from whom we have borrowed our planet, and to whom we bear sacred responsibility. We must do what America does best: offer more opportunity to all and demand responsibility from all. President BILL CLINTON (William Jefferson Clinton) continues Inaugural Address: Now, we must do the work the season demands. To that work I now turn, with all the authority of my office. I ask the Congress to join with me. But no president, no Congress, no government, can undertake this mission alone. My fellow Americans, you, too, must play your part in our renewal. I challenge a new generation of young Americans to a season of service to act on your idealism by helping troubled children, keeping company with those in need, reconnecting our torn communities. There is so much to be done enough indeed for millions of others who are still young in spirit to give of themselves in service, too. In serving, we recognize a simple but powerful truth we need each other. And we must care for one another. Today, we do more than celebrate America; we rededicate ourselves to the very idea of America. An idea born in revolution and renewed through 2 centuries of challenge. An idea tempered by the knowledge that, but for fate, we the fortunate and the unfortunate might have been each other. An idea ennobled by the faith that our nation can summon from its myriad diversity the deepest measure of unity. An idea infused with the conviction that America's long heroic journey must go forever upward. And so, my fellow Americans, at the edge of the 21st century, let us begin with energy and hope, with faith and discipline, and let us work until our work is done. The scripture says, "And let us not be weary in well-doing, for in due season, we shall reap, if we faint not." From this joyful mountaintop of celebration, we hear a call to service in the valley. We have heard the trumpets. We have changed the guard. And now, each in our way, and with God's help, we must answer the call. Thank you and God bless you all. Panning TLS gallery standing, applauding. 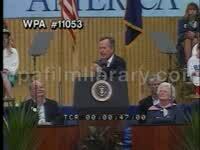 MS GEORGE BUSH and DAN QUAYLE applauding. MSs HILLARY RODHAM CLINTON with her husband; Mr. Clinton again shakes hands with Mr. Bush. Sen. WENDELL FORD (D-KY) introducing Rev. BILLY GRAHAM. Rev. Graham reads benediction; C/As BILL CLINTON, HILLARY RODHAM CLINTON, CHELSEA CLINTON, GEORGE BUSH, and BARBARA BUSH bowing heads, eyes closed. The National Anthem is then sung; requisite C/As of American flags flying, Marine standing guard, Bill and Hillary Clinton and AL GORE and TIPPER GORE singing along. God Bless America is then sung while the Clintons and the Gores shake hands and exit gallery. Wide shot of Washington, DC, zoom in to Capitol Building. Inaugural Parade. Shots of President BILL CLINTON and First Lady HILLARY RODHAM CLINTON, accompanied by Secret Service agents, walking along parade route, waving to crowds. Shots of VP AL GORE and TIPPER GORE doing same. C/As people waving American flags. Shots of the Clintons and the Gores arriving at grandstand. Wide shots of parade and parade route. TLS/MSs of the Army Field Marching Band performing. TLS/MS West Point cadets passing by grandstand. TLS Hope (Arkansas) High School Marching Band performing; MS banner announcing Hope as the birthplace of Mr. Clinton. TLS Smith County (Tennessee) Marching Band performing. TLS Jesse White Tumbling Team (of Chicago) performing acrobatics; MS elated President Clinton standing up and applauding. MS CHELSEA CLINTON waving timidly to band passing by. TLS/MSs marching bands (military and collegiate) and color guards performing. TLS/MSs unidentified African-American marching band getting decisively funky; great C/As of the Gore children (Karenna, Kristen, Sarah, and Albert III) and Tipper diggin it. TLSs cheerleaders performing to the Clinton campaign theme song ( Don t Stop ); C/A Mr. Clinton & Mr. Gore undoubtedly talking about the young uns. TLS BARNEY THE DINOSAUR of children s TV fame riding float on parade. TLS BIG BIRD, BERT & ERNIE, ELMO, COOKIE MONSTER, and THE COUNT riding on float in parade; C/A cute lil ALBERT GORE III watching. Inaugural Ball (Arkansas Ball): President BILL CLINTON and First Lady HILLARY RODHAM CLINTON arriving at ball; Mr. Clinton addresses crowd about the high-profile entertainment lined up for the event; Mr. & Mrs. Clinton slow dance on stage; great shots of Mr. Clinton playing saxophone, jamming with house band on blues number (remedial solo by Mr. Clinton, but then again he ain t never claimed to be no pro); guests on stage include DIONNE WARWICK, MICHAEL MCDONALD, JUDY COLLINS, BEN E. KING, and KENNY LOGGINS; Mr. & Mrs. Clinton wave to the crowd. President BILL CLINTON (William Jefferson Clinton) continues Inaugural Address: It is time to break the bad habit of expecting something for nothing, from our government or from each other. Let us all take more responsibility, not only for ourselves and our families but for our communities and our country. To renew America, we must revitalize our democracy. This beautiful capital, like every capital since the dawn of civilization, is often a place of intrigue and calculation. Powerful people maneuver for position and worry endlessly about who is in and who is out, who is up and who is down, forgetting those people whose toil and sweat sends us here and pays our way. Americans deserve better, and in this city today, there are people who want to do better. And so I say to all of us here, let us resolve to reform our politics, so that power and privilege no longer shout down the voice of the people. Let us put aside personal advantage so that we can feel the pain and see the promise of America. Let us resolve to make our government a place for what Franklin Roosevelt called "bold, persistent experimentation," a government for our tomorrows, not our yesterdays. Let us give this capital back to the people to whom it belongs. President BILL CLINTON (William Jefferson Clinton) continues Inaugural Address: To renew America, we must meet challenges abroad as well at home. There is no longer division between what is foreign and what is domestic the world economy, the world environment, the world AIDS crisis, the world arms race they affect us all. Today, as an old order passes, the new world is more free but less stable. Communism's collapse has called forth old animosities and new dangers. Clearly America must continue to lead the world we did so much to make. While America rebuilds at home, we will not shrink from the challenges, nor fail to seize the opportunities, of this new world. Together with our friends and allies, we will work to shape change, lest it engulf us. When our vital interests are challenged, or the will and conscience of the international community is defied, we will act with peaceful diplomacy when ever possible, with force when necessary. C/A General COLIN POWELL (in uniform). The brave Americans serving our nation today in the Persian Gulf, in Somalia, and wherever else they stand are testament to our resolve. But our greatest strength is the power of our ideas, which are still new in many lands. Across the world, we see them embraced and we rejoice. Our hopes, our hearts, our hands, are with those on every continent who are building democracy and freedom. Their cause is America's cause. The American people have summoned the change we celebrate today. You have raised your voices in an unmistakable chorus. You have cast your votes in historic numbers. And you have changed the face of Congress, the presidency and the political process itself. You, my fellow Americans have forced the spring. (Do not use audio of Peter Jennings) Black limousine arrives at the White House; President GEORGE BUSH and First Lady BARBARA BUSH (accompanied by their dog Millie) step onto veranda and welcome President-elect BILL CLINTON, HILLARY RODHAM CLINTON, and CHELSEA CLINTON; the Bushes them welcome VP-elect AL GORE, TIPPER GORE and the Gore children. Audio of Peter Jennings is not available for licensing. (Do not use audio commentary of Peter Jennings) Shots of the United State Marine Band performing "The Washington Grays March" outside the Capitol Building. Walking from White House: MS MARILYN QUAYLE and TIPPER GORE; MS Vice President DAN QUAYLE and VP-elect AL GORE; MS BARBARA BUSH and HILLARY RODHAM CLINTON; MS President GEORGE BUSH and President-elect BILL CLINTON. Shots of motorcade driving through Washington DC (black limos). MSs of Mr. Bush & Mr. Clinton exiting black limo at Capitol. MSs Hillary and Chelsea walking through Capitol. MSs JIMMY CARTER, ROSALYN CARTER and WALTER MONDALE. MS General COLIN POWELL in uniform. MS BILLY GRAHAM shaking a man's hand. MS RON BROWN. CHELSEA CLINTON is escorted by a Marine down the steps. Wide shot of the Capitol Building. Marilyn Quayle and Tipper Gore are escorted down steps. MSs Barbara Bush and Hillary Rodham Clinton walking through Capitol, down steps (Hillary carries a copy of the Bible). MS VP-elect Al Gore walks with Sen. RICHARD GEPHARDT and Sen. GEORGE MITCHELL through Capitol. MS President George Bush and VP Dan Quayle descend steps to podium. MS/MCUs President-elect Bill Clinton descending steps to podium; Rep. Gephardt, Sen. Mitchell and TOM FOLEY accompany him. Nice low angle MS Marine saluting, sun in BG so he is in silhouette. Senator WENDELL FORD (D-KY) welcomes everyone to the Inauguration, makes opening address. C/As President-elect BILL CLINTON, HILLARY RODHAM CLINTON, CHELSEA CLINTON. C/A wide shots of audience gathered outside the Capitol Building. Reverend BILLY GRAHAM makes prayer (hey, what happened to separation of church and state and the promulgation of no one specific religion? ): we thank you (God, Lord, Father, Jesus, Holy Ghost, et al) for the moral and spiritual foundations which our forefathers gave us and are rooted deeply in holy scripture we cannot say we are a righteous people for we are not we ve sown to the wind and are now reaping the whirlwind of crime, drug abuse, racism, immorality and social injustice we pray that you will bless their wives may President-elect Clinton know that he is never really alone, that eternal God can be your refuge C/As Bill Clinton, Hillary Rodham Clinton, TIPPER GORE, GEORGE BUSH, BARBARA BUSH bowing their heads, eyes closed. C/A wide shot of Washington, DC (Washington Monument & Capitol in far BG). Sen. WENDELL FORD (D-KY) introduces the Philander Smith Collegiate Choir of Little Rock, Arkansas. The Philander Smith College Choir performs City on the Hill . C/A EST shots of Washington, DC, the Capitol Building (from several views), Jefferson Memorial, etc; President-elect BILL CLINTON and VP-elect AL GORE watch the performance; HILLARY RODHAM CLINTON sways head, smiles; VP DAN QUAYLE; TIPPER GORE (I think that s daughter Karenna Gore next to her); at end, Bill Clinton applauds, waves, gives them the thumbs-up sign. Sen. WENDELL FORD (D-KY) introduces Justice BYRON WHITE. Justice White swears AL GORE (Albert Gore, Jr.) into the office of Vice-President of the United States; TIPPER GORE, KARENNA GORE, KRISTEN GORE, and ALBERT GORE III watch on; after being sworn in, VP Gore hugs his family, waves to crowd, brings Tipper over to also wave to the crowd, then hugs President-elect BILL CLINTON. Sen. WENDELL FORD (D-KY) introduces Chief Justice WILLIAM REHNQUIST. Chief Justice Rehnquist swears BILL CLINTON (William Jefferson Clinton) into the office of President of the United States; HILLARY RODHAM CLINTON and CHELSEA CLINTON watch on; after being sworn in, President Clinton kisses Hillary & Chelsea, then the three wave to the audience; C/As of Marines firing ceremonial howitzers; Mr. Clinton chats with Vice-President AL GORE before going to shake hands with GEORGE BUSH (George Herbert Walker Bush). Sen. WENDELL FORD (D-KY) introduces President BILL CLINTON. Mr. Clinton begins Inaugural Address: My fellow citizens. Today we celebrate the mystery of American renewal. This ceremony is held in the depth of winter. But, by the words we speak and the faces we show the world, we force the spring. A spring reborn in the world's oldest democracy, that brings forth the vision and courage to reinvent America. When our founders boldly declared America's independence to the world and our purposes to the Almighty, they knew that America, to endure, would have to change. Not change for change's sake, but change to preserve America's ideals life, liberty, the pursuit of happiness. Though we march to the music of our time, our mission is timeless. Each generation of Americans must define what it means to be an American. On behalf of our nation, I salute my predecessor, President Bush, for his half-century of service to America. Mr. Clinton turns and applauds GEORGE BUSH, who stands and receives a standing ovation. And I thank the millions of men and women whose steadfastness and sacrifice triumphed over Depression, fascism and Communism. Today, a generation raised in the shadows of the Cold War assumes new responsibilities in a world warmed by the sunshine of freedom but threatened still by ancient hatreds and new plagues. Raised in unrivaled prosperity, we inherit an economy that is still the world's strongest, but is weakened by business failures, stagnant wages, increasing inequality, and deep divisions among our people. When George Washington first took the oath I have just sworn to uphold, news traveled slowly across the land by horseback and across the ocean by boat. Now, the sights and sounds of this ceremony are broadcast instantaneously to billions around the world. Communications and commerce are global; investment is mobile; technology is almost magical; and ambition for a better life is now universal. We earn our livelihood in peaceful competition with people all across this earth. Profound and powerful forces are shaking and remaking our world, and the urgent question of our time is whether we can make change our friend and not our enemy. This new world has already enriched the lives of millions of Americans who are able to compete and win in it. But when most people are working harder for less; when others cannot work at all; when the cost of health care devastates families and threatens to bankrupt many of our enterprises, great and small; when fear of crime robs law-abiding citizens of their freedom; and when millions of poor children cannot even imagine the lives we are calling them to lead we have not made change our friend. MS Bill Clinton speaking. MS Ken Starr surrounded by reporters.